Note: Attaching calendars using the following method is not available to smart phone users due to limited functionality. It must be performed on a desktop session (there is a toggle on iPads to switch between mobile and desktop session). On a desktop session, open Google Calendar. Locate “Add a friend’s calendar” menu item on the left, and click the + icon. Enter (copy and paste) the calendar’s address in the field provided (see above for link). The address needs to be an ICAL link. 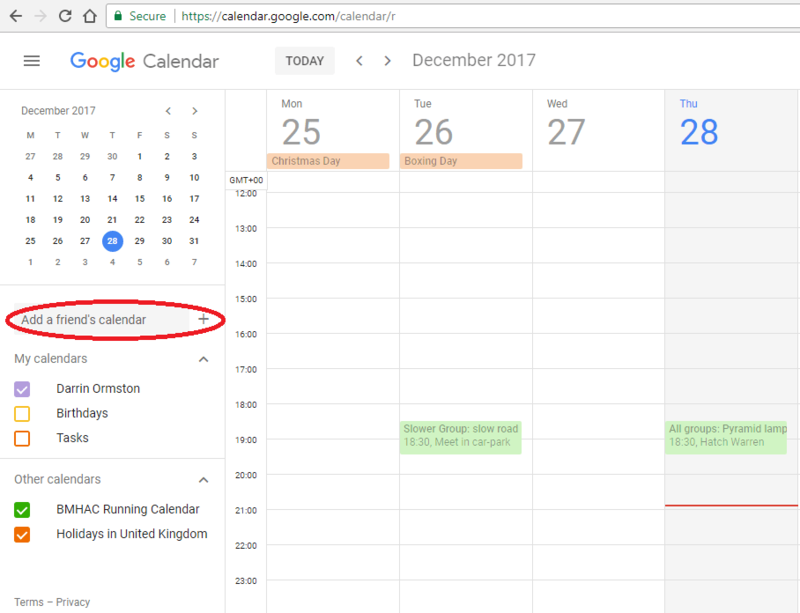 Click Add Calendar and ‘BMHAC Running Calendar’ should now show up under Other Calendars. Add your Google (GMAIL) account if you have not already done so: Settings/Accounts & Passwords/Add Account. Ensure you have turned on Calendars within the Account settings (by selecting Settings/Accounts & Passwords/Gmail). Exit Settings and open your main Calendar from home screen. Click on Calendars, and if required place a tick against the BMHAC Running Calendar under your Google account. You should now be able to view the running calendar. Note: for Android phones, you are requested to login to your Google account during initial setup of the phone. So as long as you have performed adding the iCAL URL on a desktop machine, you should be good to go once you have performed a sync. Go into you device’s Calendar app, in the settings make sure your Google account is checked, then select ‘Sync Now‘. You may need to select the Google account calendar, then under “Other calendars” check the subscribed calendars the Android device is to sync with (by default, the “Other calendars” may not be checked).